I actually broke down and picked her up yesterday. Wanda really seems to be settling in. She loves (LOVES) having a back yard to tear around in. She was out several times yesterday just racing around like the big puppy that she is. Not to jump the gun or anything, but this dog may be my dream dog. I've had a lot of dogs over the years and some of them were more like roommates than real companions. Wanda has the potential to be a true companion. She seems to be very interested in whatever I'm doing and has that wonderful desire to please that makes a dog really trainable. I’ve had her less than 24 hours and I’ve gotten her to stop jumping on me, heel on a leash and not be a bed hog! The harshest correction I've given her so far is a tug on the leash and a firm "No". 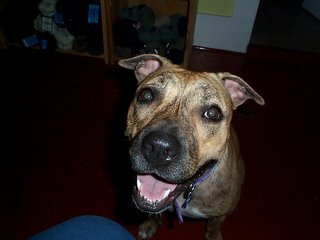 Next on the list are not jumping up on other people (she gets so excited), getting along with my mother’s dogs and behaving by herself in the kitchen and bedroom while the shop is open. I’m not that worried. Here's Wanda keeping me company while I work on the computer. 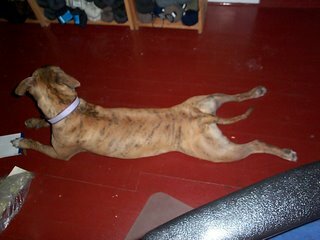 Here she is being a Frog Dog. I've always wanted a Frog Dog! Here she is enjoying her new back yard. 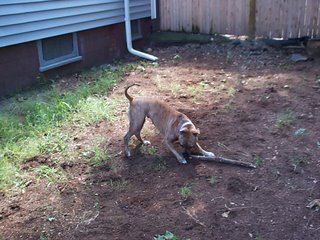 I give that stick a week before she reduces it to sawdust. Meanwhile, if you're in the area, come by the shop and I’ll be glad to introduce you to the newest member of the family! Tomorrow, dyeing pictures. There aren’t many. I wasn’t feeling that great Monday and Tuesday so I only got some done. I’ll try to get the rest dyed over the next week or so. 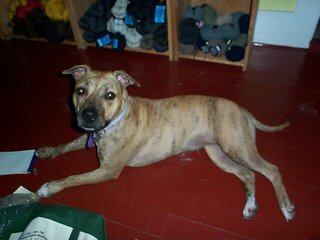 Hooray-- visitors can pet the newly dyed yarn and the newly adopted dog! Compulse Not Danielle. Repeat it like a mantra. This sweater is going to be fine! what do we do for the wanda welcome wagon (besides not say that 10 times fast)? So exciting that you two are getting on well! i can't wait to meet her. i love wanda already!! how can you not adore a frog dog? she looks like she's already calling it her place- think how much more wonderful her life is now that she found you! I might be back to meet her next weekend! Looks like she's settling in! I'll be by to meet her sometime this weekend, I hope, thanks to dirt cheap air fare. Yay Melissa and Rosemary! I can't wait for you to meet the new girl.